MYRTLE BEACH, South Carolina–Rep. 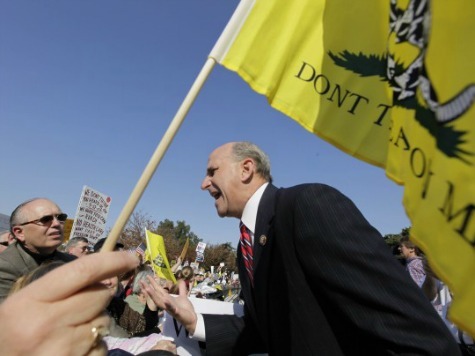 Louie Gohmert (R-TX) called on grassroots conservatives and Tea Partiers across the country to organize and fight back against the GOP establishment’s efforts to stamp out the movement during his speech to the South Carolina Tea Party Convention here on Sunday morning. Gohmert argued that conservatives need a ground game and an organized strategy to stop House Speaker John Boehner, Karl Rove, and the Chamber of Commerce from destroying the Tea Party movement. He rendered a lengthy quote from the infamous scene in the classic movie Animal House, where Bluto riles up the fraternity to fight back against the administration when things seemed darkest for them. “So, a big national organization of corporations has declared war on us,” Gohmert said. So, some guy with a whiteboard has declared war on us. So, the Speaker may have declared war on us. Let me borrow from Animal House: “What’s all this laying around stuff? Why would anyone just lay around when our liberty, lives and loves are on the line? Did someone say let it go? The war’s over? What? Over? Did someone say over? No. It’s not over until we decide it’s over. Was it over when the Germans bombed Pearl Harbor? No! Well it ain’t over now! Because when the going gets tough, the tough get going!” What happened to the Tea Party I used to know? Where’s the spirit? Where’s the guts? This could be the greatest time of our lives but you’re going to let it be the worst because we’re afraid to go with Louie. We might get in trouble. Just kiss my aspen tree. From now on, not me, I’m not going to take it. We’re not going to take it anymore right? We’re going to stand up and take our country back! Earlier in his speech, Gohmert said the the vote on the Troubled Assets Relief Program (TARP), the bailout, was the most important vote he ever faced in Congress. Gohmert said former Rep. John Shaddegg (R-AZ), who voted for TARP but then later expressed regret to Gohmert about the vote, is an example of how certain people who cast bad votes can be forgiven–as long as they do not do so repeatedly, and actually understand why what they did was a mistake. Because of the combination of all of this, and because of the far-left views of President Barack Obama, Gohmert then argued the Obama administration is out of control. “What’s going on these days?” Gohmert said. We’ve got the NSA getting logs of every call you make. The IRS is weaponized like Richard Nixon could only have dreamed of. A law enforcement arm of the U.S. was forcing the sale of guns to people so they could get them to drug cartels to kill hundreds of Mexicans and even at least one or more Americans. You got a U.S. administration supporting rebels in other countries that are infused with America’s greatest terrorist enemies but the administration cannot even call them “radical Islamists” that they are, while we’re punishing countries like Egypt that has finally stood up them. We have Republican leaders who are not content to lose presidential elections but now they think we need to get moderates who will stand not for anything but for everything. Soon thereafter, Gohmert added that the Obama administration’s policies have caused rifts between the U.S. and its allies in the Middle East, particularly Israel but others too. “We have betrayed repeatedly our best friend in the Middle East, Israel, to the point that they don’t trust us and they don’t know what we’re going to do,” Gohmert said.